Boys Town 22.18pcpx, 1965 Boys Town Christmas Charity Seals PCP Sheet Set, F, MNH. Seven (7) full sheets of progressive color proofs of the 1965 Boys Town Charity Seals. Never folded, imperforate, full rich colors. All with full undisturbed gum. Boys Town 22.18pcpx, 1965 Boys Town Christmas Charity Seals PCP Sheet Set, F, MNH. 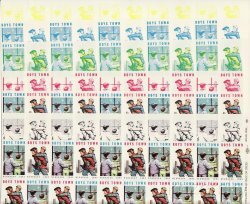 Seven (7) full sheets of progressive color proofs of the 1965 Boys Town Charity Seals. The full sheet sets are relatively rare and usually not found in this pristine condition. Never folded, imperforate, full rich colors. All with full undisturbed gum. The eighteenth Boys Town Charity Seal was issued at Christmas in 1965. Two types were issued, with that date. The two alternating seal designs are similar to the past designs, but dated "1965." Multi-colored, seal size: 221/2x38, perf: 121/2; Sheet of 50, 10x5; Union Label: Fleming-Potter Union Label to right of seal 10. Progressive Color Proofs are usually issued in sets to show colors separately and in combination. In this instance, the progression is as follows: (1) yellow, (2) blue, (3) 1+2, (4) Red, (5) 3+4, (6) black, (7) completed sheet. 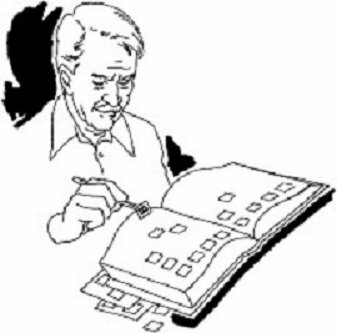 The design used for the PCP sheet set was the 22.18x1A. Sheets are imperforate.